Someday Never Comes...: Does a Life of Comfort Keep Us From Growing??? Heads up, if you came here strictly for moto/travel related tips and tricks, skip this and come back soon. That said, let me wax philosophical for a moment based on my internal findings over the past few days/weeks. I'll start by saying, 'being comfortable with being uncomfortable' is well... uncomfortable. However, I've come to realize that a life of comfort is a slow, silent killer. Let me explain. As you know by now, I gave up a very comfortable life to be where I am now. I was married, had what many would consider a great job/career, owned a beautiful home in a beautiful city, and was able to participate in many activities that made me 'happy' outside of work. I'm not sure where it came from exactly, but it was engrained in me that I had to do/achieve/have all of these things in order to live a productive life or be, well, happy. Turns out, I was there and found that none of it had much to do with my own personal growth and happiness. Over the past few days I've been struggling with some depression and found myself at a bit of a 'low'. At first I chalked it up to a combination of being on the road for almost seven months, having my friend Sam around, which was a reminder of my life and responsibilities at home, bike/mechanical issues that have cropped up, and a general lack of direction on where I'm headed next. In addition, I let those negative feelings marinate enough to where I started to look back on my past life, and yearn for the comforts of what was, and even mourn the loss of it. I spent a LOT of time over the past few days thinking about this. Why, when I was unhappy then, would I ever want to consider backtracking down the same path? It became obvious that it wasn't the past that I craved or wanted, but it was simply the comfort it provided. I'm at a point in the trip where I'm struggling for comfort. I have a fairly major issue with the bike that continues to rear its ugly head (fuel pump/cutting out/stalling). Couple that with several other 'issues' that I've been dealing with and resolving over the past few weeks (i.e. bent rear rim, shot rear tire, front wheel bearing and chain/sprocket replacement, blown fork seal, etc) and it has been tiring getting everything dialed with the bike. In addition, I've had a friend traveling with me over some rough and exhausting routes, which while it has been absolutely amazing, having him here has also been a close reminder of my life back home, how I need to eventually head back, where exactly 'home' will end up being, what the 'F' I plan to do for work when I get there, and whether or not I've gained enough from this trip (i.e. personal growth, insight, etc) to make the whole thing worthwhile. Needless to say, when we got to Lima I was in a bit of a funk. I certainly craved comfort. "Nobody ever died of discomfort, yet living in the name of comfort has killed more ideas, more opportunities, more actions, and more growth than everything else combined." Maybe I was high on the much needed endorphins from the run, but after reading that quote I had an immediate sense of elation and remembered why the hell I decided to take off on this crazy adventure in the first place. "Avoiding pain wouldn't be a problem if we did it once or twice a year. But for most of us, it's a deeply ingrained habit. We barricade ourselves behind an invisible wall and don't venture out because beyond the wall is pain. The safe space is called the Comfort Zone... The Comfort Zone is supposed to keep your life safe, but what it really does is keep your life small." Again, a shot to the chest. Granted, some would say this entire trip is a bit outside of most people's comfort zone. However, it would be easy for me to consider the issues of late as a journey outside of my personal comfort zone (current comfort zone being - riding with no issue, perfect weather, having an idea of where I want to live and what I want to do, no crime related issues, having an income, etc). 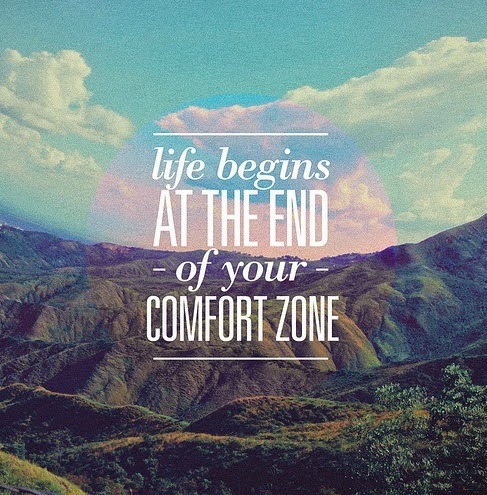 This morning I looked back on previous 'outside the comfort zone' moments in life. I thought long and hard about some of them, and was reminded that while challenging at the time, "at the end of the comfort zone, life truly begins". That said, I'm not ready to hang this journey up just yet. In fact, I feel like it's just beginning. I know as soon as I'm done I'll long for the freedom and adventure that I'm experiencing currently. I don't want to take that for granted, I want to soak in every moment. I know I'll look back on the 'issues' that arose and smile. I know the hard parts will be the most memorable, and the moments where I learned the most. After working with several companies and people over the past few weeks, I've gotten the bike back up and running. As you read in the last post, although difficult, the issues as of late have been resolved. 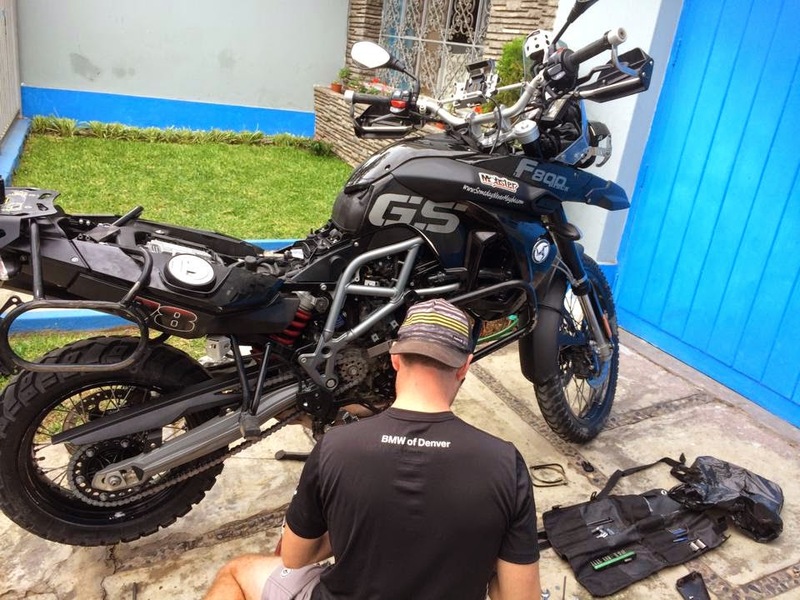 Yesterday I spent the entire day at the BMW dealership here in Lima trying to solve the final outstanding problem with the bike (stalling/cutting out at low speed - stuttering/surging at medium speed). While we didn't get it fixed entirely, we did rule out the fuel pump/fuel filter as the issue by checking fault codes and cleaning the entire assembly. Today Sam and I went to work removing the charcoal canister on the bike, which is a U.S. only feature to trap evaporative fuel vapors from the tank. However, if this gets clogged it can cause venting issues with the bike. 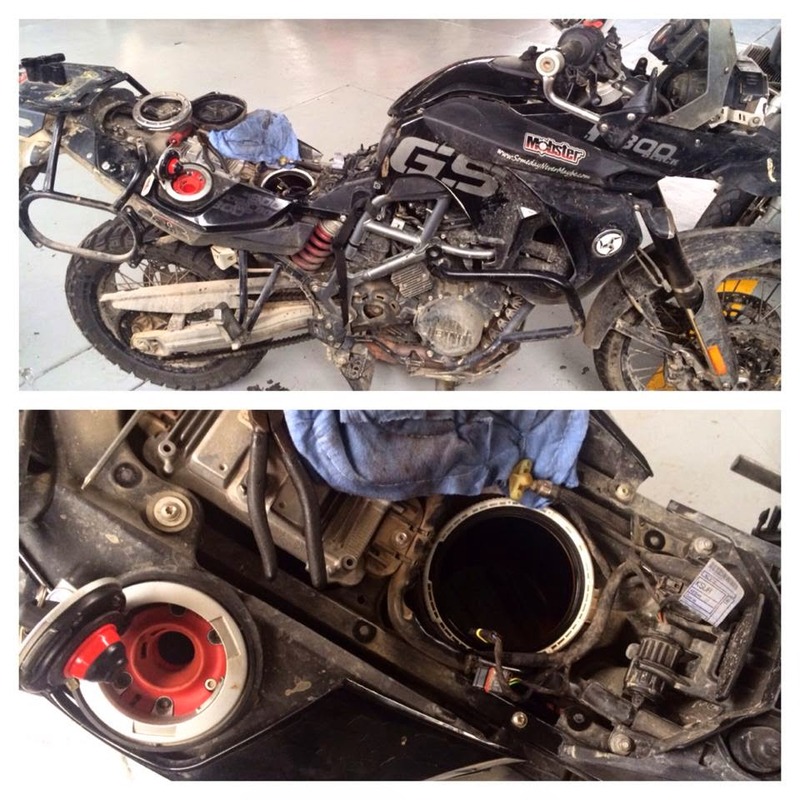 So, we performed a 'canisterectomy', and I'm happy to report that both owner and bike are doing well after the surgery (note - we did find that there was a venting issue, and the can was full of fuel, gunk, and liquid). In addition to the removal, I've reset the EFI, changed the air filter, checked fault codes, cleaned entire fuel pump/filter assembly, and took apart, cleaned, and replaced the fuel cap assembly to check for vent leaks. I also bought some injection cleaner today here in Lima and will cycle that through the next few tanks of gas. Needless to say, I'm hoping I've resolved the last of the issues. It's one thing to venture slightly outside of the 'comfort zone', an entirely different thing if the bike stops running in a remote/isolated area of Bolivia... That my friends could be considered (in Archer voice) the 'Danger Zone'!!! All jokes aside, I'm headed into the most isolated/tough part of the trip, so I need to ensure that the bike will run reliably. Now that the bike is semi-buttoned up, I'm ready to continue the journey south. I'll leave here Monday and head through Arequipa, Colca Canyon, then cross into Bolivia after exploring Titicaca from both sides of the border. In Bolivia I'll do the Yungas region (Death Road, etc), and will then head south for some very isolated rides all the way to Potosi, the mines, and to/through Salar de Uyuni. After all that, I'll cross into and explore northern Chile and Argentina, and will then shoot down to Buenos Aires. I've done a lot of research and will probably utilize Dakar Motos to assist with shipping the bike back to the States. However, before that happens, I have a lot to explore, and I'm sure PLENTY of opportunity to become very uncomfortable. Something I'll do my best to learn from and try to enjoy. A life of comfort is appealing. This is why people stay in jobs, relationships, and situations that they aren't happy in. Unfamiliarity (i.e. being uncomfortable) scares us, and this fear of the unknown is what limits growth. For some reason society thinks that personal comfort is the meaning of life. 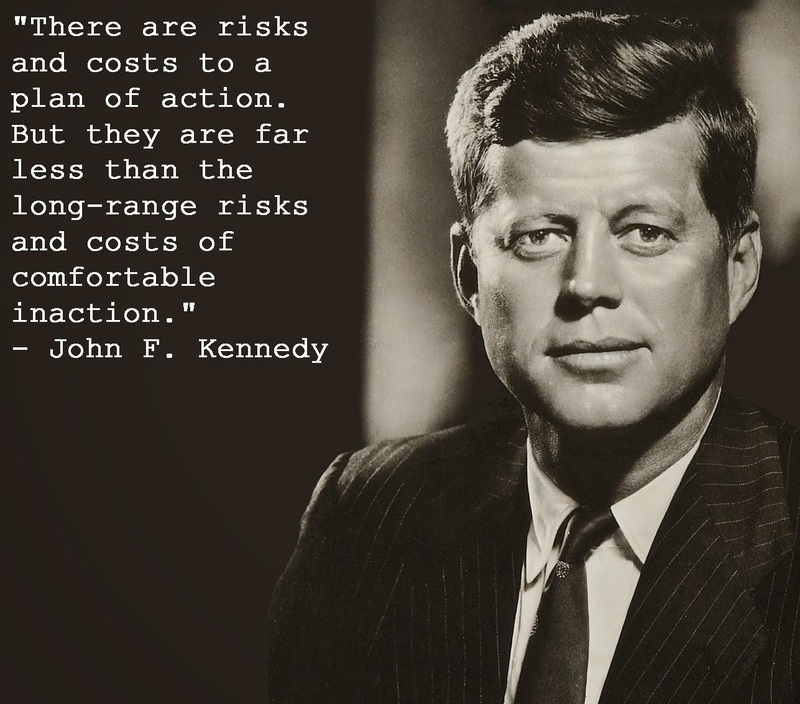 I for one won't forget the importance of being uncomfortable. Because for me, that's where the gold is. That said, it's time to flip the lid closed and ride on!!! ***Post edit*** - I'd like to say that I don't under appreciate how incredibly fortunate I've been throughout my life (both past and present). I know I've had many, many opportunities and good fortune along the way that has allowed me to live a lifestyle that many would envy. I don't want to come across as selfish when I talk about my 'past life', like I don't realize how amazing things were (or are for that matter). I just want to stress the point that, without constant effort/change/lack of fear to branch out, a life of comfort and monotony can seriously limit personal growth and well being (in my opinion - which may not even be worth $.02). Also, I'll share one final thing. My father wrote a few notes to me the other day. I love and cherish receiving advice from him, and respect most everything he says. Figured others might get something from it as well. There is nothing bad about comfort, or desiring comfort. Be grateful that you have comfort. Enjoy the comfort that your education and hard work afford you. Just stay awake, don't take it for granted, and don't be lazy. Invest excess energy in your family, hobbies, volunteer work, job, etc. Don't chase 'happiness' as the goal. Happiness will come and go. Do look for jobs, hobbies, and relationships that are compatible with your personality, goals, and your gifts. This is where satisfaction comes from.